Capillipedium assimile (Steud.) A. Camus, Lecomte, Fl. Gen. de I‘Indo-China. 7: 314. 1922. Hsu, Fl. Taiwan 5:626. 1978. 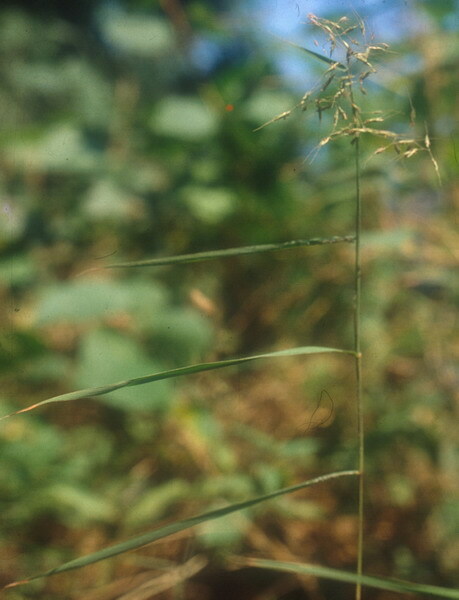 Andropogon assimilis Steud. in Zoll. Syst. Verz. 58. 1854, in Syn. Pl. Glum. l: 397 1854. Bothriochloa assimilis (Steud.) Ohwi, l. c. 11: 165. 1942. Bothriochloa picta Ohwi, l. c. 11: 167. 1942. Culm hard, geniculate, about 1 mm across. Blade linear-lanceolate, about 3 mm wide by 13 cm long, midrib conspicuous, hirsute, basal part covered with tubercled hairs. Inflorescence a loosely opened panicle, branches and pedicels capillary. Spikelets paired, dimorphic; the upper pedicellate; pedicel longitudinally grooved, margins ciliate; the lower sessile, fertile, about 2.6 mm long, excluding the long awn. Lower glume subcoriaceous, lanceolate, about 2.6 mm long, laterally 2-grooved, acute, upper part brownish-red, ciliated on the upper back; upper glume broadly lanceolate, as long as the lower, margins inrolled, 2-keeled, keels ciliate, backside pubescent, 5-nerved; upper lemma about 1.2 mm long, topped with an awn of 7 times the length of the lemma, 1-nerved; upper palea hyaline, ovate-lanceolate, about 0.8 mm long, rounded, sparingly ciliate. TAIPEI: Shihlin, Tanaka 13618. MIAOLO: Miaoli, Hsu 549, NANTOU: Wushe, Hsu 11315. TAITUNG: Chengkung, Liu 31. Distributed in India, Burma ascending in the hills to 2,000 m, extending to Thailand, China and Taiwan. This grass grows on hills and often appears gregariously on mountain slopes. It is said to be eaten by cattle and buffaloes but the culms eventually become very woody and are not relished. The woody culms are bamboo-like in appearance and distinguishes this species from C. parviflorum.